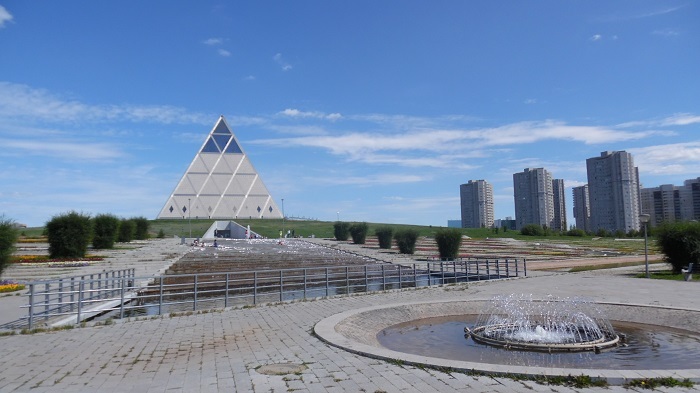 The Palace of Peace and Reconciliation, sometimes referred to as the Pyramid of Peace and Accord, is a modern structure in the form of a pyramid that serves as an event venue which is located in the capital city of the Republic of Kazakhstan, Nur-Sultan (Astana). 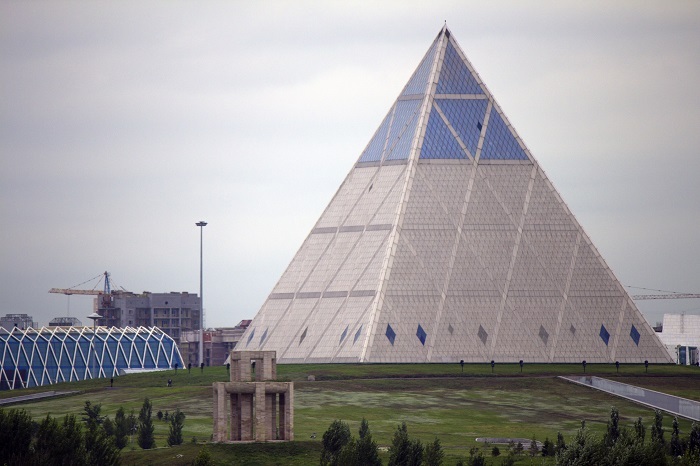 Representing a symbol of friendship, unity and peace, the construction of this modern marvel was suggested by Kazakhstan’s president, Nursultan Nazarbaev, who wanted it to be built in order to be the center of the Congress of Leaders of World and Traditional religions that takes place every year in Astana. 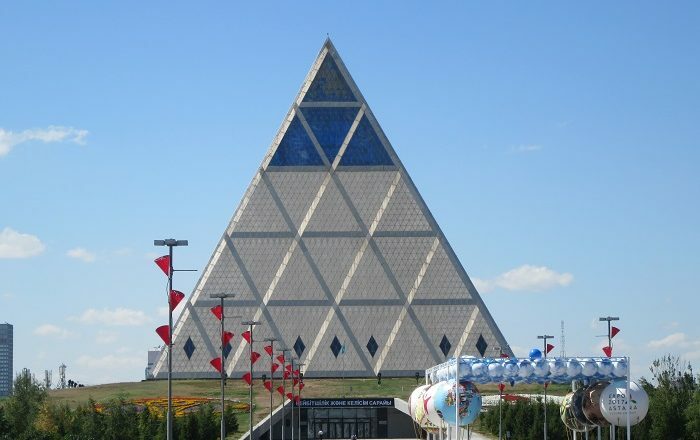 Built between 2004 and 2006, the Pyramid was designed by the famed British architect Norman Foster who created this modern architectural masterpiece that has a floor area of about 28,000 square meters (300,000 square feet) and incorporates also an opera house, educational facilities, exhibition halls, a gallery, a press center and a national center for Kazakhstan’s various ethnic and geographical groups. 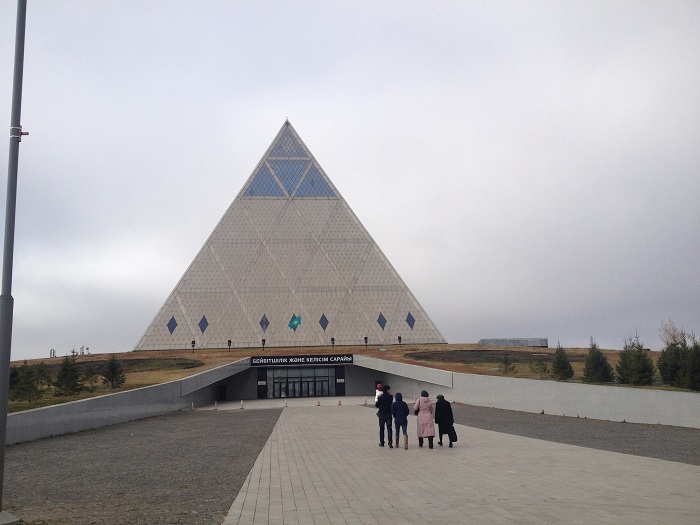 The base of the structure is 62 meters (203 feet) long and wide, with the highest point being too 62 meters (203 feet) above the surrounding area, and it is entirely built in stone with glazed inserts that allude to the various internal functions, while at the top is an apex of stained glass that was designed by the artist Brian Clarke. 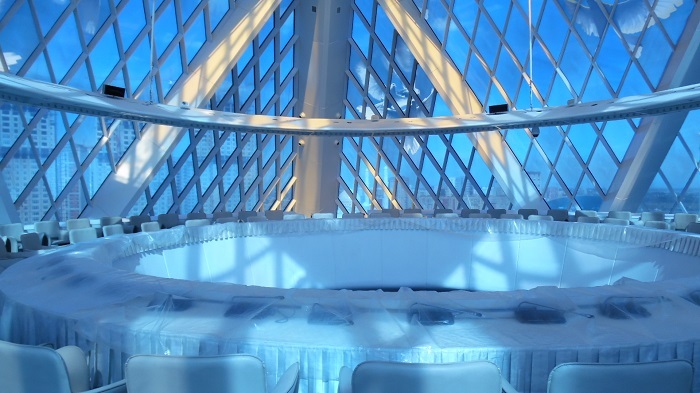 Within the building, the entire space is organized around a soaring central atrium that is often animated shifting colored light patterns, and there is even a glass lens in the floor which casts light down into the auditorium, creating a sense of vertical continuity from the lowest level to the highest point. 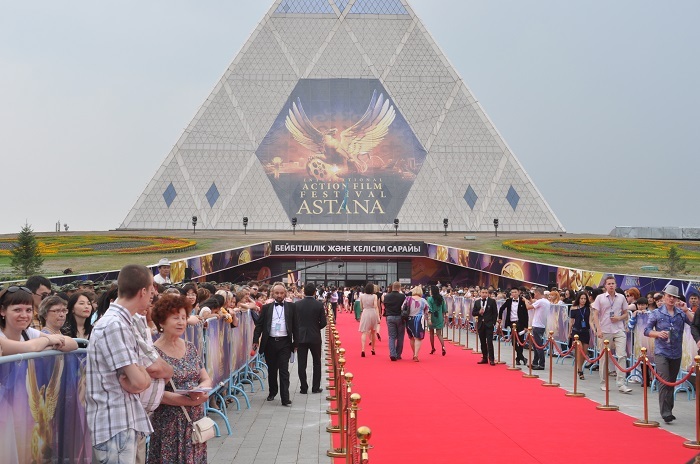 Supported by four inclined pillars that are referred to as “the hands of peace”, the assembly chamber is where most of the main events are taking place. 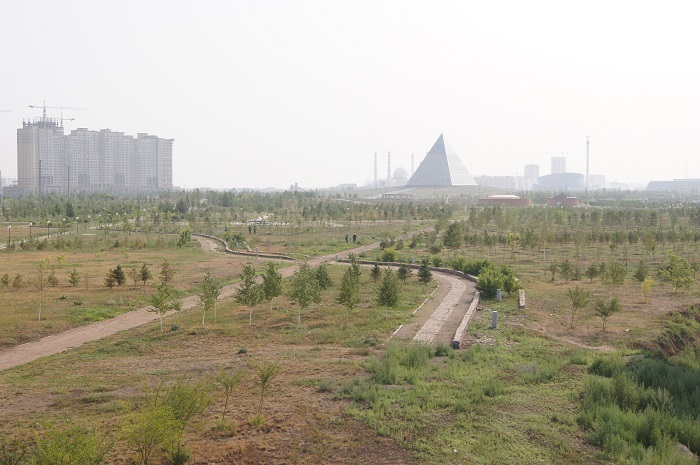 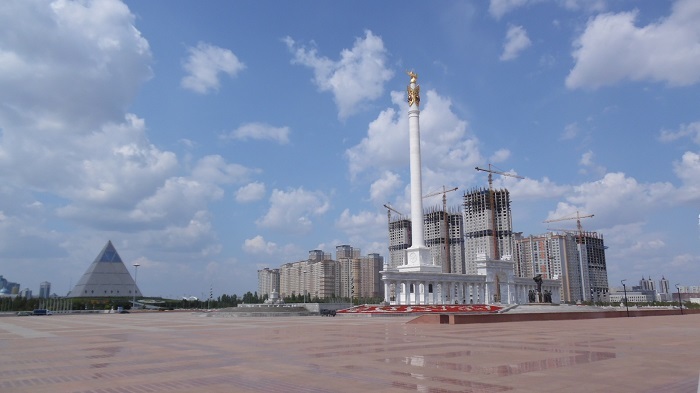 Still, one of the greatest challenges for the building is the harsh weather of Astana that varies greatly in winter and summer. 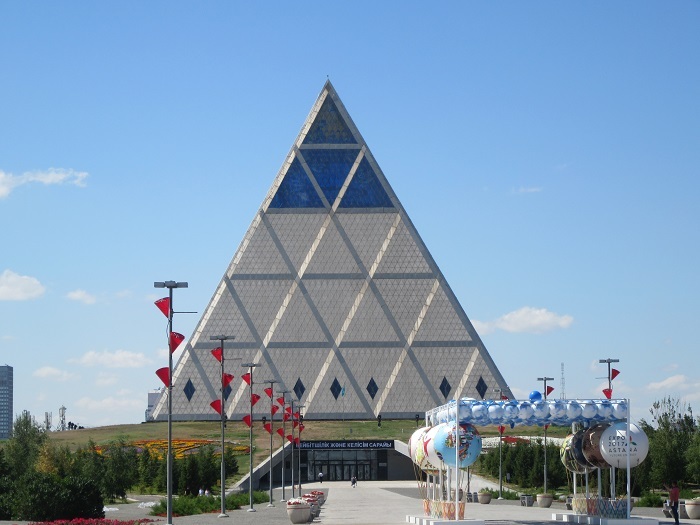 That is why the engineers had to construct a steel and concrete skeleton which is able enough to withstand the expansions and contractions of the constructing material since the winters can bring temperatures of maximum -40 degrees Celsius (-40 degrees Fahrenheit) up to 40 degrees Celsius (104 degrees Fahrenheit) in summertime. 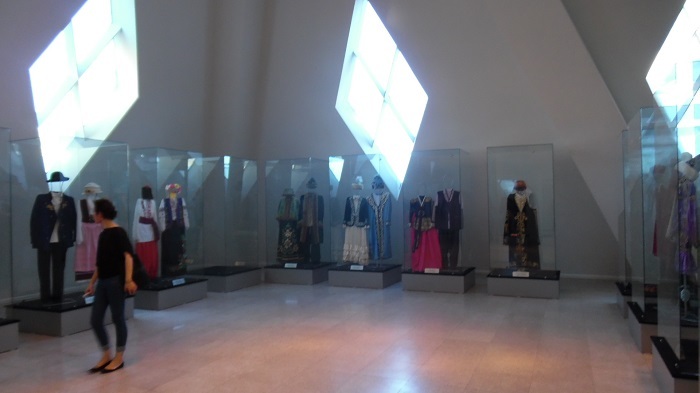 Open for the general public every day, the Palace of Peace and Reconciliation is certainly one of Kazakhstan’s truly unique buildings that can be found around the newly constructed capital, which attracts visitors who would like to get a glimpse from the different national costumes of the people who live in the country, while embracing the unity of the people and religions. 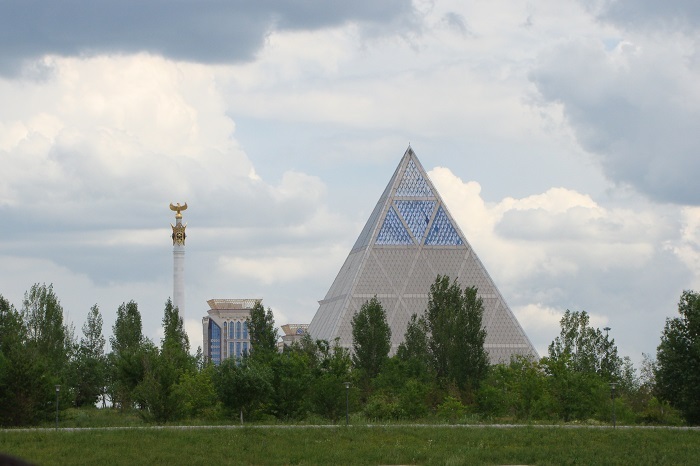 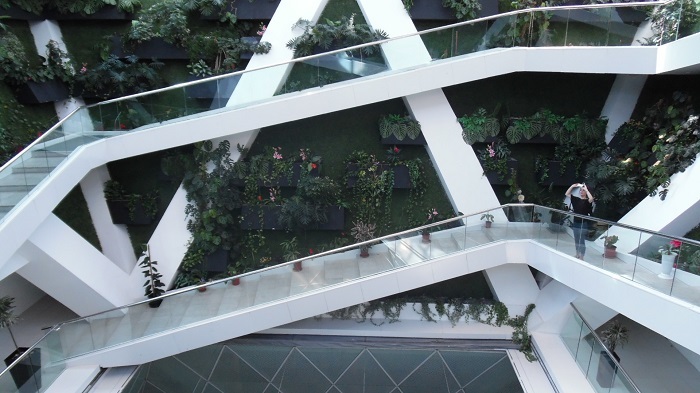 All in all, offering wonderful views of Astana, this modern palace is something that will inspire people from all corners of the world to flock to Kazakhstan and embrace the message of peace and love it transpires.